My analysis of Val McClathey's photo of the alleged Shanksville crash made the news at the Pittsburgh Post-Gazette. They have visited Mrs. McClatchey's office and called her at home, posting satellite maps of her property and accusing her of digitally altering her photo to insert a fake smoke plume. The bloggers have picked apart her story, highlighting inconsistencies in different news accounts and questioning her motives. About Mrs. McClatchey's "End of Serenity," Killtown concludes that either the smoke plume in the photo came from a bomb blast closer to her house, or that the picture was faked by Mrs. McClatchey or the FBI. Killtown writes: "If the first is true, then Val may be off the hook. If any of the latter two are the case, then Val, you got some splainin' to do!" 1. 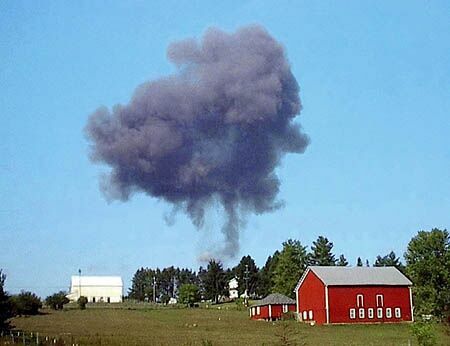 "Conspiracy theorists blog that Flight 93 photo is fake"
About Mrs. McClatchey's "End of Serenity," Killtown concludes that either the smoke plume in the photo came from a bomb blast closer to her house, or that the picture was faked by Mrs. McClatchey or the FBI. The title of the article should have read: "Conspiracy theorists blog that Flight 93 photo may be fake"
2. "The smoke plume doesn't line up right, they say. It is too large in the frame. The smoke is characteristic of an ordnance blast, not a jet fuel fire, further evidence that the government shot down Flight 93." I do not believe Flight 93 was shot down and no where do I mention this theory in any of my blog posts or website, so I'm not sure where Ms. Cleary got this from. I used to believe Flight 93 was shot down a while ago, but theorize now that all the early shoot-down rumors where spread on purpose to distract us from the evidence that no Boeing 757 crashed in Shanksville. Maybe Ms. Cleary accidentally lumped me in with the 9/11 researchers who still believe that Flight 93 may have been shot down. 3. "They have visited Mrs. McClatchey's office and called her at home, posting satellite maps of her property and accusing her of digitally altering her photo to insert a fake smoke plume." The "they" who visited Val's office were Victor Thorn and Lisa Guliani of WING TV who called Val's work number that they found listed on the internet and made an appointment to meet with her at her office the same day. Lisa told me Val jumped at the chance to be interviewed without hesitation and drove over right away to meet them at her office. I'm not sure if any other 9/11 researchers has visited Val at her office. Saying "posting satellite maps of her property" kind of makes it sound like I posted them to let the world know where she lives to "pay her a visit" or something sinister like that. This was not my intent. My intent was to show where her house is in relationship with where her camera was pointing and with where the crash scene was. It was simply done to prove my analysis of her photo. I'm also not necessarily accusing her of faking this photo. I'm saying it could be one possible scenario with the others being that the government could have faked it with or without her knowledge, or that it is authentic which proves an ordinance blast originating much closer to her house. I hope the latter to be true. 4. "This Killtown, whoever he may be, I find it very disturbing that this is a 16-page attack on me personally," said Mrs. McClatchey, who opened her real estate company a year and a half ago. "My business is named. That hurts me personally. It's pretty disturbing. My whole life is out there, a map to where I live, a map to my office. It's a safety issue for me. There's some crazy people out there." I found Val's home address and business address by doing a simple internet search. Anybody could easily find her addresses on the net then pop them in a map search and find her work or home. It is really no big secret and it's not rocket science. I didn't write my blogpost and do my analysis of her photo as a personal attack on Mrs. McClatchey. I hold no personal grudge against her. I did it because I find her photo suspicious and possibly a fraud. Since she took the photo, she would logically be the first one to suspect of fabricating this photo if it is indeed a fake. I truly hope she is speaking the truth about her photo being authentic because not only will that mean that she is off the hook, but it means most importantly that her photo proves that there was an ordnance blast closer to her house, far from the alleged crash scene of Flight 93, and then the U.S. government will have a lot to answer to! 5. "Killtown posits whether the World Trade Center towers were brought down by explosives, and whether the Pentagon was hit by a missile." Not to get sidetracked, but that is just one scenario that I hold about what hit Pentagon by the way. Although I'm really not concerned with what did hit the Pentagon as much as concerned about what didn't hit it (i.e. Flight 77). 6. "(The blogger identified only as Killtown could be reached only via e-mail. He or she agreed to be interviewed without ever revealing identity and never got in phone contact with this reporter.)" I'm a "he" btw. I had asked Ms. Cleary that I wish to remain anonymous for my own personal reasons and that I'd be happy to interview via email or instant messaging. She was experiencing email difficulties at her work, so it took a long time for her to receive my emails and she seemed reluctant to communicate via instant message because she feared it might run into the same difficulties as her work email problems. I assured her it wouldn't, but then I went ahead and tried to call her from a phone a couple of times, but since we are in different times zones, I was unable to get a hold of her directly over the phone and chose not to leave a voice message. She then mentioned in her last email to me that if I didn't get a hold of her over the phone, that she would just quote directly from my blogpost because her deadline for the article was approaching. I replied and told her that was perfectly fine because there really wasn't anything more I had to add that I didn't already mention on my blogpost. 7. "He then proceeds to post her home address, phone number and personal e-mail information." This again kind of makes it sound like I posted her personal information for "sinister" reasons. All this information about her is easily accessible on the internet. The phone number I posted is her work number from her own work website. 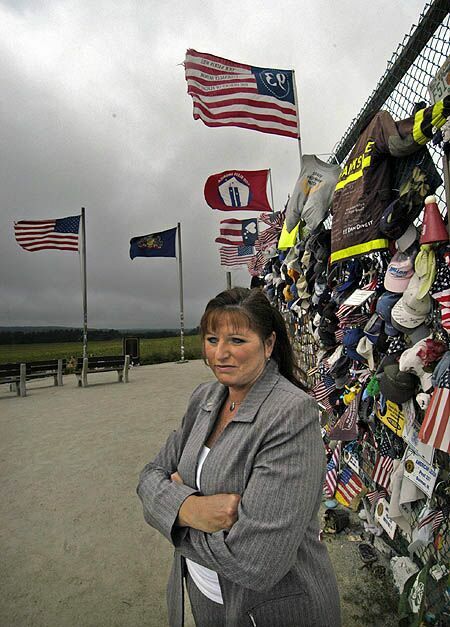 I found her work website by googling "end of serenity shanksville". I did find her home phone number also, but specifically choose not to post that because I didn't want anybody to bother her at home. I posted her personal email (which is posted on the internet too) if people wished to contact her. One small thing missing in the article that I was kind of bummed about is that it never linked to my blogpost that the entire article was written about. Seems like that Pittsburg Post-Gazette is a little behind the times in regards to how mainstream media articles are linking to websites that are of the subject, or related to their articles. Even though the article seems to paint Val as a victim from being targeted by "obsessed conspiracy theorists," overall I'm quite happy with the article. The truth about 9/11 will have a hard time coming out if the mainstream media doesn't report our views of what really happened. I applaud Ms. Cleary and the Pittsburg Post-Gazette for having the guts to write and publish this article. I hope more in the mainstream media will follow suit. Please send Ms. Cleary a letter of thanks for writing this article. Cleary can be reached at ccleary@post-gazette.com or 412-263-2533.